Being 3 Gallery is proud to present: Zhu Xiaodi “Unlimited” . Zhu Xiaodi's artistic practice reflects an “Unlimited” dual identity - that of architect and artist – both read in the double form of "Tolerance" as the metaphor of the exhibition gallery. The dual identities of architect and artist, have focused Zhu Xiaodi’s advance of contemporary art and architecture for a long time. In this exhibition, Zhu Xiaodi applies the elements of light, line, and shadow to endow the notion of “Tolerance as virtue” by creating a limited space that defines the physical boundary (a square with six sides of the original church space). Starting from tangible materiality and moving to intangible spirituality, the viewer experiences an opening into a spiritual state created by the elemental combinations of the artistic structure. The personal experience within the space provides an inspirational touch that extends beyond the formal display of art. Specifically, language is generated from within the structures in order to touch the heart... Art has the inherent ability to inspire when created by the skill, energy, intention and talent of an artist who taps the capacity of the mind to open doors within the existence of material form. "Trace" in Zhu Xiaodi 's Chinese ink painting, awakens matter (paper) connected to the nib of the pen through the movement of lines. In a parallel echo of mind to matter, the trace of pen to paper is revealed. Behind Zhu Xiaodi’s Chinese ink painting, lies the originality of mining the intrinsic nature of his chosen materials and fusing them to a unique manner of artistic creation. Neither the description of objective things nor the performance of subjective images, his art is a manifestation given birth through the interaction of mind and matter. Artworks are often produced, by merging various possible elements of fate. “Unlimited” Space/Ink Painting Art exhibition is Zhu Xiaodi 's latest creative experiment, as Zhu Xiaodi himself has expressed, “Art cannot be repeated,” in this case as the elements of the exhibition come together through the complicity of creator, interpreter, and reader. In that way, are we still reading as before? Can we feel and become immersed in the deep meaning of painting works? 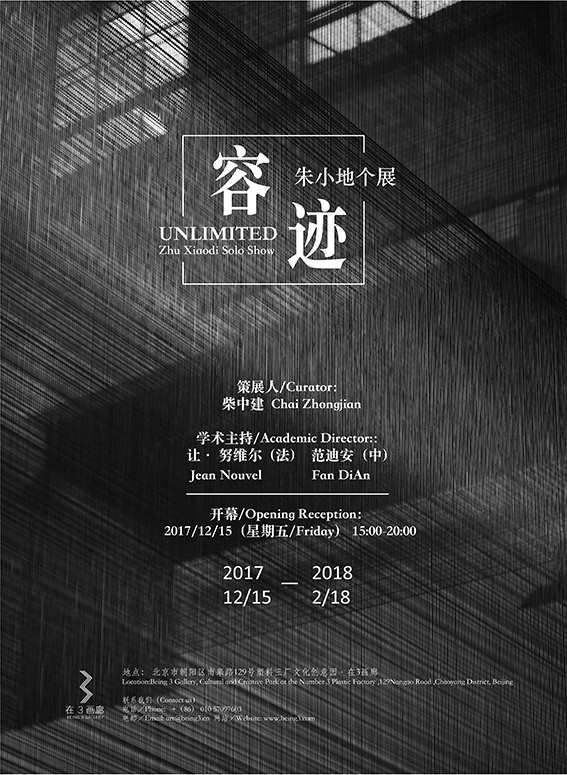 Zhu Xiaodi 's catalog, shown together at this exhibition, will provide a reference to help understand the "Unlimited" Exhibition. Hosted by the Being 3 gallery, this exhibition provides the opportunity to invite outstanding academics, artists, architects and other guests to a large scale and significant academic seminar, Multi-field of Vision: Discussion on Architecture, Ink painting, and Contemporary Art. The gallery looks forward to inspiring more constructive sparks by providing a platform for the intersection of multiple perspectives.